Cram was used in two journeys as sustenance- the first in The Hobbit, and second in The Lord of the Rings. “More of a chewing exercise”, this rather unexciting food is made by the men of Esgaroth and Dale. 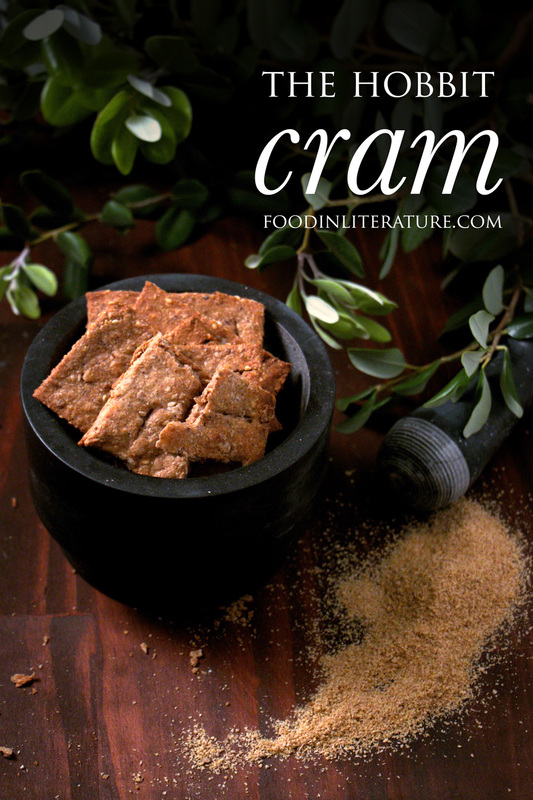 There are many forums that discuss cram, and many agree it’s a type of hardtack. Hardtack is a biscuit made of flour, water and salt, taken on long trips to sea, that lasts for months. Because Tolkien probably took inspiration from rural England, I wanted to make this recipe wholesome and rustic. To do this, we’re using plain flour and wheat germ to bring the flour back to it’s ‘less refined’ version- wheat germ is removed during the milling process when creating flour. While not an exciting food to eat, the nut flours and sesame seeds add additional nutrition to the biscuit and provides a quite lovely taste. Walnut, almond or hazelnut is recommended, nuts that have been used even in the Middle Ages in the UK. Pre-heat oven to 375F | 190C. Add in the water, and stir. Once too difficult to stir, take clean hands and knead until combined. Roll out to ½ inch or less thick. Slice into squares and make even slices or punctures with a knife or fork in the middle. Bake for 30 minutes one side, then flip and bake for 30 minutes on the other. Remove from oven, and let cool before storing for a long hobbit journey. I love the concept of using nut flour to give the cram extra flavor and nutrition. Great idea!